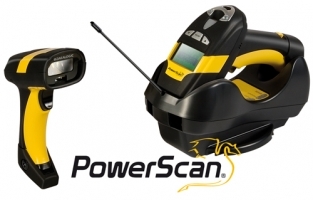 The mobile scanners of the PowerScan8300 family offer the same professional and robust characteristics as the wired versions. The extremely durable housing is made of impact-resistant ABS plastic and is designed for constant use in industry and retail. As a battery-powered model it still offers particularly long operating times. It can perform over 60,000 scans per charge and has a short charging period of only two hours, making it suitable for all applications in production and logistics. In order to make barcode scanning possible even under very noisy conditions, the scanner is equipped with a clearly audible beeper with adjustable volume, extra-bright LEDs and a targeting spot for easy scans. It is a high-resolution laser scanner with a large read distance and a fast microprocessor for all common one-dimensional barcodes. The scanners of the PowerScan M83xx series submit all data in the licence-free 433MHz frequency range, with bidirectional communication between scanner and host.